Frederic Jameson is widely regarded as one of the most original and influential Marxist critics of the last decades. His most controversial work, The Political Unconscious, had an enormous impact on literary criticism and cultural studies. 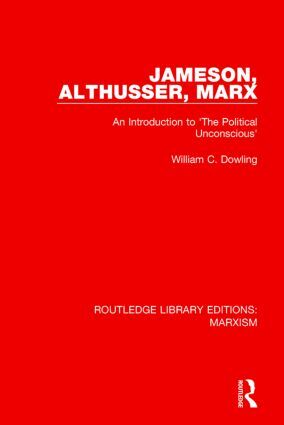 In Jameson, Althusser, Marx, first published in 1984, Professor Dowling sets out to provide the intellectual background needed for an understanding of Jameson’s argument and its broader implications. He elucidates the unspoken assumptions that are the foundation of Jameson’s thought – assumptions about how the nature of language, of interpretation and of culture – and shows how Jameson attempts to subsume in an expanded Marxism the critical theories of Derrida, Foucault, Deleuze, Lacan and of structuralism and poststructuralism in general. This lively, concise book will be welcomed by anyone interested in current theoretical debates, in Marxist criticism, and in the wide-ranging implications of Marxist cultural theory for the social sciences, the arts and the study of history.